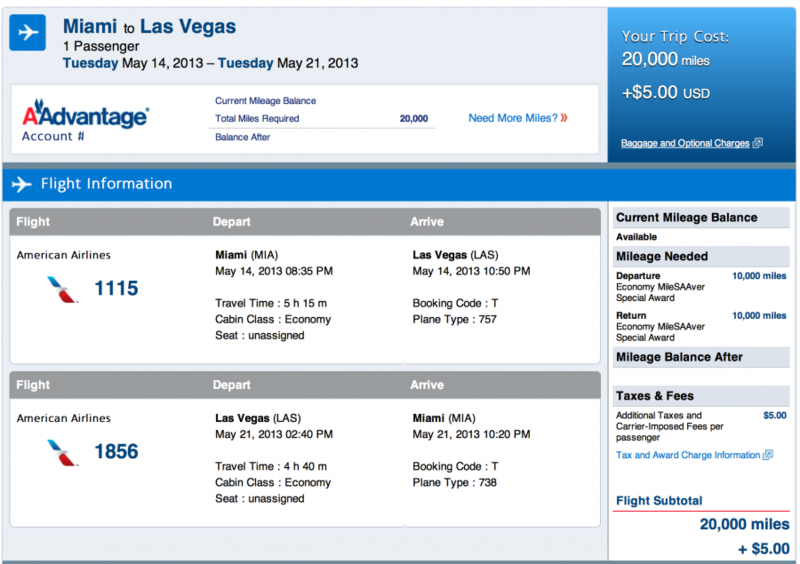 Now through May 31, 2013, American Airlines is offering discounted economy awards to Las Vegas. Normally domestic awards cost 12,500 miles each way, or 25,000 miles round-trip, but with this special offer, they are only 10,000 miles each way meaning you can save 5,000 miles per round-trip when heading to Vegas. American Airlines is offering discounted awards to Vegas. This award special is valid for travel on flights marketed and operated by American Airlines from the U.S., excluding Alaska, Hawaii and the U.S. Virgin Islands to Las Vegas, for MileSAAver Economy Class awards only. The reduced mileage offer is not valid from May 23, 2013 – May 25, 2013 and May 27, 2013 – May 28, 2013. Discounted Miami-Las Vegas award for 20,000 miles. To take advantage of this, you can book online or by calling American Airlines AAdvantage Reservations at 1-800-882-8880. As a reminder though, American charges a $75 close-in ticketing fee for awards booked less than 21 days in advance, so you’d have to pay the $75 to save the 5,000 miles, since this offer is only good till May 31st, which is less than 21 days out. However, American does waives this fee for Advantage Executive Platinum, AAdvantage Platinum and AAdvantage Gold members using miles from their account. If you do decide to head to Vegas, also check out the Destination of the Week: Las Vegas, to see some of the best places to stay in Las Vegas and some fun things to do while in town. Who’s going to take advantage of this offer? Feel free to leave a comment below!